Marvel's Spider-Man: City At War #1 Review – AiPT! 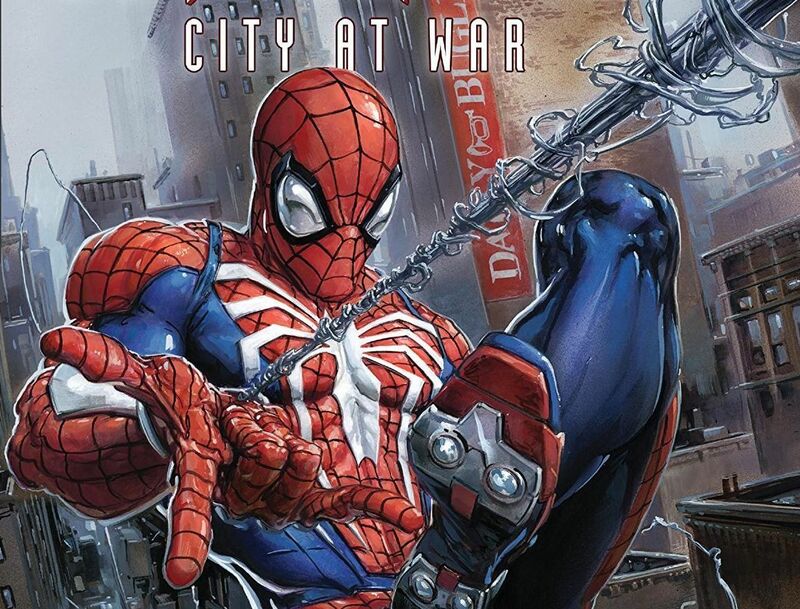 Marvel Comics is kicking off their “Gamerverse” this week with Spider-Man: City at War #1. It’s a comic set in the recent Spider-Man PS4 universe and in fact, follows the story of the game. If you’ve only played the game and want to get into comics, it makes a lot of sense to start here. Mark Basso explains in the welcome that follows this story this is a series that Marvel is committing to. That means new stories outside of the games, but also the development of supporting characters and the exploration of scenes not in the game. If you’re reading this and have the thought, “Wait, I’ve seen this all before,” you’re not alone. This issue follows the story from the first few hours of the game. Readers who haven’t played the game are in for a treat since this will all be brand new, but as a gamer who finished the video game, I can say it’s still fun to see the story again in comic book format. Writer Dennis ‘Hopeless’ Hallum has done a great job with dialogue, keeping Spidey punchy and funny when he needs to be. This is a solid rendition of Peter thanks to the dialogue, and really all the supporting characters. They are of course slightly different in this universe but sound faithful to the game. I actually wondered if the dialogue is identical to the game, but I didn’t look! Artist Michele Bandini knows how to draw a mean Spider-Man. A full-page splash of the character thwipping through NYC is proof of that. Iconic moments from the game are rendered well too, showing off how comics can do things as well as if not better than a game. Take for instance a moment where Spidey is punching Kingpin down a through a skyscraper. They fall from top left of the page all the way to the bottom right, helping your imagination connect the dots. Familiar faces like Doc Ock and Captain Watanabe are spot on too. Something I didn’t expect to like is the pace of this issue. Having played the game, many hours are depicted here, making it feel jam-packed with content. At the pace it’s going I imagine the game story will be completed by issue #6, although it could very well slow down too. Now that, is a great splash page. The fact that the story is rehashed certainly makes this less exciting than a fresh story. Overall I didn’t notice anything new added unless you count dialogue. It’s not a straight adaptation, but it’s not adding a whole lot just yet. As a big fan of the PS4 video game, I can say I’m dying to see this comic series catch up with the game story. It’s nice to recap the adventure and it certainly brings fond memories, but it’s going to be exciting to read further adventures in one of the coolest game universes ever made. This is an easy 9 out of 10 for anyone who hasn’t played the game. As a big fan of the PS4 video game, I can say I'm dying to see this comic series catch up with the game story. It's nice to recap the adventure and it certainly brings fond memories, but it's going to be exciting to read further adventures in one of the coolest game universes ever made. This is an easy 9 out of 10 for anyone who hasn't played the game.